Earlier in September we were thankful to see two more people put their faith in Jesus and be baptized. Andi is a young mother who lives in our town of Petofibanya. Years ago as a child, she attended our church without her parents but then drifted away as she entered her teen years. 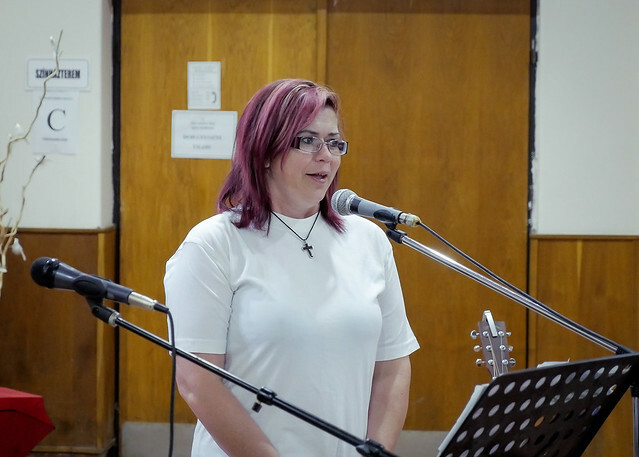 God had planted seeds in her heart and just this year in our Summer Vacation Bible School, Andi was reconnected with us. Andi shared: “I used to be a very negative person. I had no peace, I was quick to be angry and I often lied. When I went to the last day of the VBS where parents were invited, there were many that spoke about Jesus. When I returned home, I heard the Lord speaking to my heart. Since that time I have a new joy and things began happening in my life that I can’t even believe.” Praise God for pursuing Andi and helping her find her way back to Jesus and His life changing gospel. Andi’s mother Irén has also begun attending worship services and house group. Please pray for Irén to understand God’s call on her life to turn to Him and live by faith in Jesus as Lord and Savior. “Two things happened to me in the hospital that were amazing. The first was with a Romani mother who was with her child. As this mother was going back and forth for different tests for her child, she stopped and asked me, “Is that a Bible you are reading?” It turns out that she was seeking God but just didn’t know what to do. She shared that she wanted to be saved and baptized and began talking about how her husband was opposed. In that moment, I remembered how I was in the exact same situation just months before. I told her that she was looking at someone that had the same experience and encouraged her to continue seeking God. I found out that she lived in Kálló which is not far from Karton where my friend Edit lives. Edit is the person that first introduced me to Jesus in this very hospital on this same floor! I told her not to hesitate when she returned home and go right away to see Edit to find out more about being saved. Praise God for the opportunities He has given Hajni to help others know Him and for giving her a new Spirit led attitude that shines the light of Christ in her everyday life. 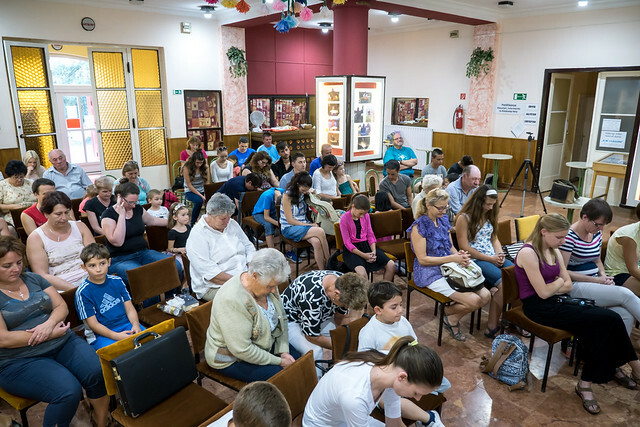 Above: Family members and acquaintances from Bogács gathering around to witness the baptism of Izabella and Mazsi a few weeks ago. Above: Izabella (pink) next to Mazsi. Both of these women have known us for many years as we travel weekly to their village for Bible studies. The house we have been meeting in weekly is actually Izabella’s father’s house. You can read about the first time I met Izabella in this blog post from 2013. Click here. Above: Mazsi is married to Izabella’s brother Pukandur. In the very first few weeks I began getting to know Pukandur in 2013 he was open, but soon after he began joining the crowd of other men that ridicule faith in God. For years, team members would meet off and on with Mazsi but it was difficult with her husband’s opposition. Praise God that in spite of the ridicule she decided to put her faith in Jesus and be baptized. Her husband attended the baptism but unfortunately could be heard in the background laughing and continuing in ridicule. 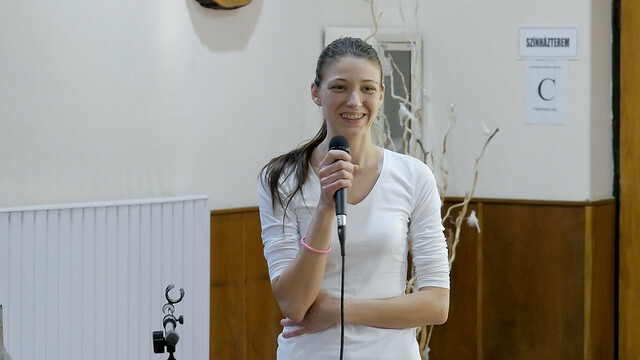 Praise God for giving Mazsi this boldness along with Izabella who also has a partner Süni (the father of her three children) who openly ridicules faith in Jesus. 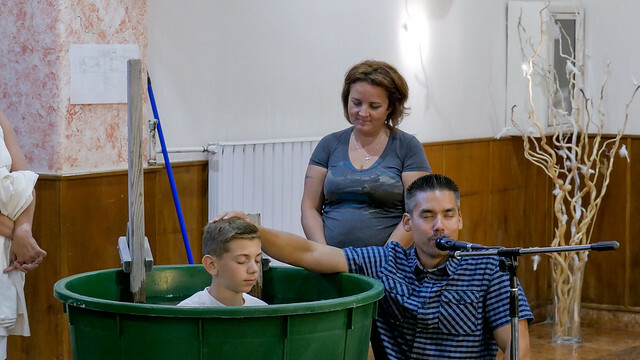 Above: Robi’s baptism in Bogács in February of this year. 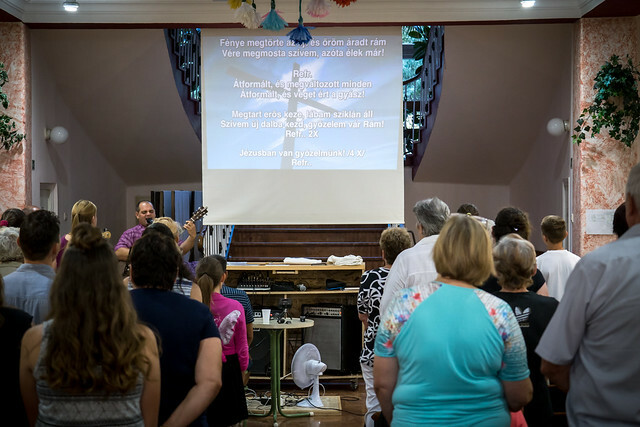 Robi is one of only two men that have come to faith since we have served in Bogács. Soon after Robi’s baptism he had to return to prison to finish time for a previous crime. While in prison, Robi shared his faith in God with others including the prison social worker. At one point, Robi said he was in such despair in prison that he decided to write a letter. He said it wasn’t addressed to anyone, he just poured out his heart to God and crumpled up the paper. He was sending it to God. The next day, he was unexpectedly called to the prison warden and given the news that his time had been cut short and he would be released shortly! Robi knew that God received his letter and was amazed at His gracious response. Please pray for God to transform men’s lives in Bogács. Pray for men to humbled and that Jesus reveal His gospel with power to them as he did with Paul in the book of Acts. Pray for the women who have been redeemed to have opportunity to continue meeting with us to study God’s word. 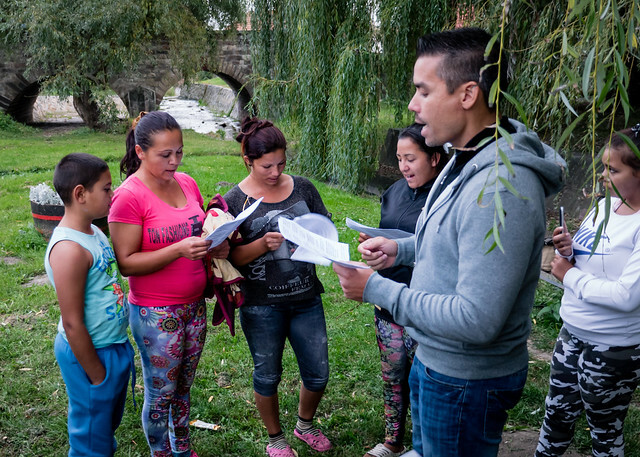 The following week after their baptism, Mazsi not only was able to attend the Bible study, but she invited her brother Zsolti as well. God opened up a door to explain the gospel to Zsolti and I asked him to consider what I shared and for us to talk more next week. 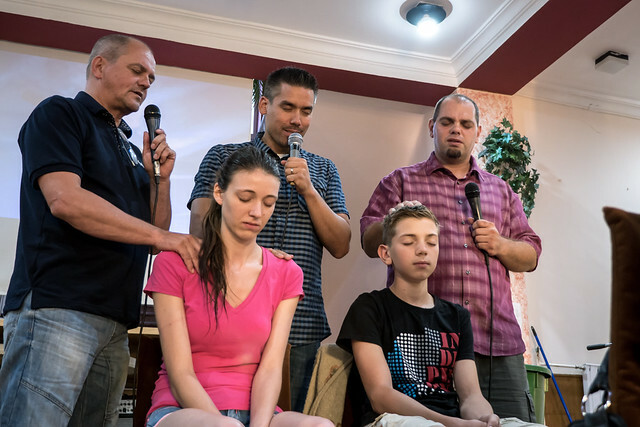 We’ve also recently seen a softening in the heart of Izabella’s younger sister Maci who seems closer than ever to repenting and putting her faith in Jesus. Please pray for Maci and Mazsi’s brother Zsolti! 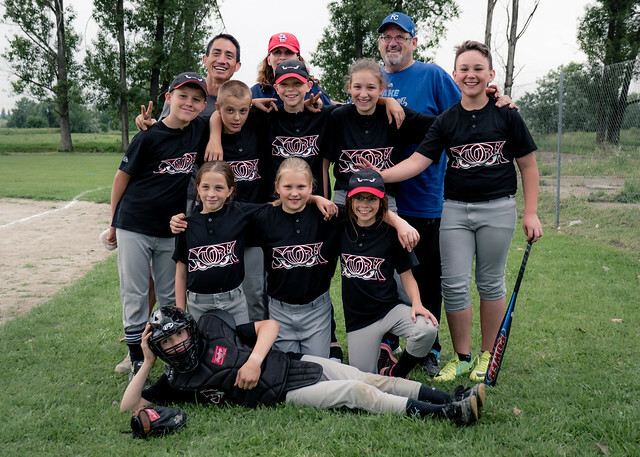 Above: Congratulations to the our hometown’s first little league baseball team that finished third in the playoffs! What a great job for their very first year playing in the league. Teammate Roger (last row left) and first year teammate Tom (last row right) plan on continuing coaching these kids for the new season. They are even considering helping renovate a local plot of land that has been overrun with weeds and abandoned and convert it into a baseball field. There is also a vision for future summer baseball camps with partners from the US helping and sharing their faith with these kids. This is a great opportunity to have continued interaction with kids and parents in the community and lead in a way that reveals Christ and the hope we have in Him. Here is a short film that gives from highlight photo’s from this past season.